When we talk about the fathers of JAZZ you got Louis Armstrong and Duke.. in my eyes those are the pillars baby!The Duke Ellington Biography shows us how true "talent" can be considered timeless! Duke Ellington was a major force in jazz from the 1920s through the 1960s and his work continues to be influential today. He is considered by many to be the greatest American composer. The Duke Ellington Biography shows that the dude was so cool that he had the looks and the style and the talent to take the world by storm... the cat was so classy you could not resist him! He had many hits including Take the A Train (words and music by Billy Strayhorn), Satin Doll, Rockin' in Rhythm, Mood Indigo, Caravan and Sophisticated Lady. Throughout the 1920s and 30s, Ellington often shared composer credit with his manager Irving Mills until they had a falling out in the late 1930s. Billy Strayhorn became Ellington's collaborator (not always credited) from 1940 until Strayhorn's death in the mid 1960s. His works were always tailored to the talents of the musicians in his band, including Johnny Hodges, Bubber Miley, Joe 'Tricky Sam' Nanton, Barney Bigard, Ben Webster, Harry Carney, Sonny Greer, Otto Hardwicke, and Wellman Braud. Many musicians stayed with him for decades! These cats liked playing for Duke because he made their sounds shine... and he treated them well too! Ellington started playing around Washington D.C. in his teens, then formed a band 'The Washingtonians', which he moved to New York City in 1923. Ellington & The Washingtonians played at various New York Clubs and toured New England as a dance band until they got their first big break in 1927. When the then much better known Joe 'King' Oliver held out for more money at the prestigious Cotton Club, the job as house band was offered to Ellington. This was the best known of the Harlem clubs, and 'Duke Ellington and his Jungle Band' became well known nationally thanks to the regular radio broadcasts from the Cotton Club. In this setting Ellington had a chance to write music in a variety of styles for dance theater acts as well as extended specialties for the band. These appearances featured many experiments in tonality, with trumpet screams and wah-wah, and growling saxophones. The Cotton Club was a great laboratory for Duke to try things and see what worked, what made the crowd move and what music they dug! When Ellington left the Cotton Club in 1931 he was one of the best known African-American celebrities, recording regularly for several record companies and featured in motion pictures. Ellington continued to tour with his band around the United States and Europe, plus a tour of much of the rest of the world in the 1960s. But even as players left and the popularity of swing diminished, Ellington continued to find new outlets, new forms and new sidemen. He frequently composed in longer forms modelled on classical music, such as his Black, Brown and Beige (1943), and Such Sweet Thunder (1957), based on Shakespeare. Thats right folks! This cat Duke had no fear with getting down with Shakespeare to bring some creativity to jazz! His Diminuendo and Crescendo in Blue with a rocking saxophone interval by Paul Gonsalves in 1956 at the Newport Jazz Festival greatly increased his fame and drawing power. He also wrote for films, starting with Black and Tan Fantasy in 1929, but also Anatomy of a Murder (1959) with James Stewart, in which he appeared as a bandleader, and Paris Blues (1961), which featured Paul Newman and Sidney Poitier as jazz musicians. You couldn't stop the dude from exploring his passion and the crowd ate it up like "grits and gravy"! Ellington was nominated for a Pulitzer Prize in 1965, but was turned down. His reaction: 'Fate is being kind to me. Fate doesn't want me to be famous too young.' The cat was always a classy guy! Duke Ellington died on May 24, 1974 and was interred in the Woodlawn Cemetery, The Bronx, New York. A large memorial to Duke Ellington created by sculptor Robert Graham was dedicated in 1997 in New York's Central Park near Fifth Avenue and 110th Street, an intersection named Duke Ellington Circle. When you think of jazz... the art of jazz is from Duke! He took it to another level with his compositions! 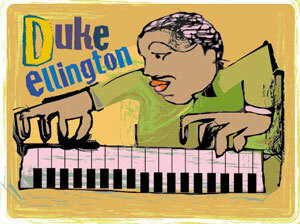 Back to Duke Ellington Biography and Other Jazz Cats!